SPIN Selling is quite an old concept, yet it’s being popularised again these days. Everywhere you look, people talk about SPIN Sells and what the best SPIN technique is. The idea of SPIN sells came about back in 1988 when the SPIN Selling Book was released by a guy named Neil Rackham. The idea behind the technique lies in asking the right questions at the right time, which makes is sort of a technical solution to a very technical problem, the problem of selling stuff to people. Rackham based his SPIN Selling Question on more than 30.000 sales calls did over 12 years. This well-researched book is still in the top bestselling selling books of all time because it’s still a viable source of information for your salespeople around the world. Like with all types of selling techniques, keep in mind that SPIN selling is not a “one-size-fits-all” so you’ll have to see what works best for you. The first phase is the situation questions phase. In this phase, your goal is to learn more information about a client’s process, resources, and results. All you need to do is to explain to the client that you just want to quickly go through their current situation because you’ll better use their time if you know what’s what. Well, it all happens with pacing and then leading. This is actually an NLP technique and it allows you to set the pace of a conversation by starting from exactly where the client is at. You mirror their sayings and then gain trust with it. Did I get that part right? Help me out here, how is a process like this one managed? How do you keep track of this part of the process? How does this interest in the client’s results and progress help you sell him stuff? 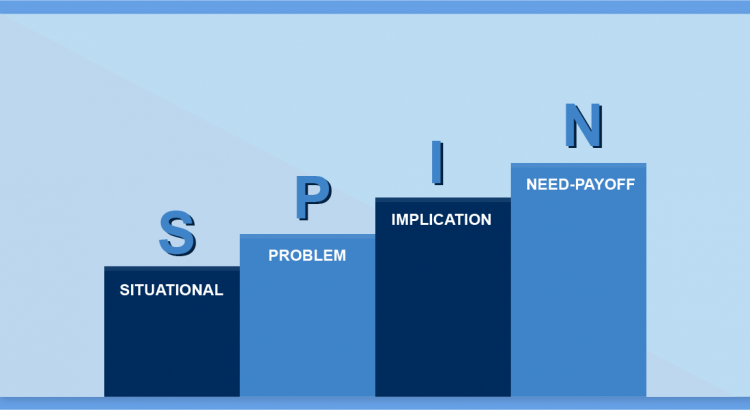 The second phase of SPIN Selling is to get your client to point out the issues they’re having on their own. There’s nothing more powerful than having your client say the problems they’re having out loud. How many hours did you guys spend on this thing? Was this expensive to be done? What is the biggest pain you’re facing right now? Have you ever tried to solve this issue in a way or another? In this phase, your goal is to make the clients point out the problems that subconsciously bothers them on a daily basis. The truth is, your clients will often know part of their problems, but not the whole picture, not the entire aspects of it. By asking questions, you’re helping them out in finding these deeper aspects of the problems on their own. You are a stranger to your client and although they can’t trust you, they do trust their own heads and will push them into the false consensus effect. In this phase of the SPIN technique, you’re going to help yourself by helping your client see the problems they’re facing on their own. It’s going to sound to them like you’re really going above and beyond to try and impact their business in a good way, but all they do is find the problems they’re having on their own. In this way, the clients will actually reach for one of the solutions on their own, rather than you having to push it on to them yourself. If this doesn’t happen, what’s the impact on the team going to be? If this resource is giving you these problems, what’s the investor going to say about it? If you are unable to do this, how much time/money is this going to take from you to fix it? This is the last phase of the SPIN Selling technique. With this final phase, you’re simply leading the client into identifying the entire set of benefits for a solution that they come up with and that you can help them achieve with your product or service. If you’ve done your job right until this phase, the client will start telling you the benefits of your service or product and they will not even realize it until they’re done with it. Why is it that you need this action or goal to happen, what makes it so important to you and the company? If you could spend the money to reach this goal, what’s the impact on the overall firm going to be like? If you were to be able to see this end goal that is now unreachable, how would that come in handy for the success of your enterprise? As with any technique that’s older than the olds, SPIN is also talked about as an outdated one. People call it rough, hard and ineffective in a world where people rely on computers to tell them what to do, not on people. Due to which we have modernized the SPIN technique. 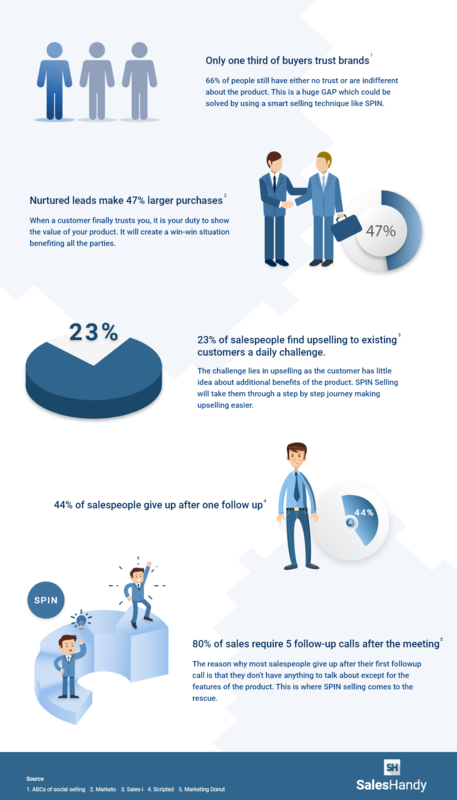 One of them is the social selling technique, highly appreciated by the modern day salesperson. Yes, SPIN might be one of the most used sales techniques in the world, but the truth is, we live in a world that’s constantly changing day by day, hour by hour and this fast-paced time had done some significant damage to the good old SPIN. More recently, the buzz on social media is all about this social selling technique, which is odd because, in reality, this too is an old, 20+ years in the making technique. If you’re a modern salesperson, you must be able to come with a bag of information that’s relevant in helping the purchasing process at any given level, not just at the start as the SPIN technique is trying to do. LinkedIn has conducted a research in which they found out that up to 92% of buyers are more likely to talk with a salesperson that’s also his own personal brand when making a purchase decision. This means we should talk about where is the purchasing process going from here on, not about the evolution of the process, when engaging with a new prospect. If you put in the time to read the SPIN technique more carefully, you can clearly see that the digital spectrum is the perfect partner of the salesperson. It allows for the sales seniors to shift the balance of power in their favour, rather than in the favour of the computer or social media. With the help of the digital tools every salesperson has at hand, sales intelligence will allow you to look for the exact companies that might need one of the solutions in your package of offers. Because everything is available online, you will be able to skip the S, or Situation part of the SPIN, because you’ll have the precise information and also the context of their now-being on the web. You can actually show the client you’re interested in their firm by doing a simple background check on them. You don’t even have to do monitoring hard-core, as things used to be back in the days. You have a ton of relevant, immediately available stocks of information at your fingertips. In the exact same way, you can work out predictive leads. You will be able to accelerate and also automate the work of the salesperson by searching for the prospects that actually match with the solutions you’re offering. If they happen to be outside of your targeted medium, you can simply avoid wasting your time on them. The Digital Age is also beneficial for the modern-day SPINner in the N, or Need/Payoff stage of the technique. With the help of tools like Artificial Intelligence, you can get some help as a salesperson to find the absolute best solution for your new client. Let’s take the example of a large company where, surely, there can be hundreds of appropriate solutions you can take on for them. How would you ever know which one to take on? Which one is the best for them? Which one is surely going to work? If you put in all of the data you’ve collected in an IBM Watson, for example, you can search for the best solution that a salesperson might’ve never have found on themselves. Let’s recap the most important parts of the SPIN Selling Technique, Situation, Problem, Implication and Need/Payoff. One of the things you need to keep in mind is to never treat the above questions as a to-do list. You have to go through each of them and identify the ones that will surely help you during your call or meeting. They need to be making sense of the product or service that you’re offering, but also for your prospect as you need to make them seem natural and fitting during your conversations. As always, you will gain a lot of confidence and trust in the technique by practicing it more and more. Practice makes everything better and can even make it perfect. Ask a colleague to help you out with some of their time and set up a call with them, in which you exercise this technique on your own. See what works and what not, how things are evolving and what’s there to be rethought and improved upon. That’s how you learn, by actually putting yourself on the spot like you were to be talking with a real future client. Also, another way to gain more experience is to attend a call another more experienced colleague is having with one of their clients. Skyrocket your sales with SalesHandy!